This starter is a twist on the traditional prawn cocktail, which would be great for Christmas day or any festive meal. Mix the mayo, ketchup, brandy and Tabasco in a bowl, season and set to one side. Cover and leave in the fridge till needed. Peel, then chop the avocados into small chunks, tossing in lemon juice as you go so they don’t discolour. Mix the prawns with half the sauce, add the avocados and stir gently to coat everything. Heat a griddle pan or grill. To make the crostini, rub a little olive oil onto each slice of ciabatta and grill on each side for 1-2 minutes until toasted. 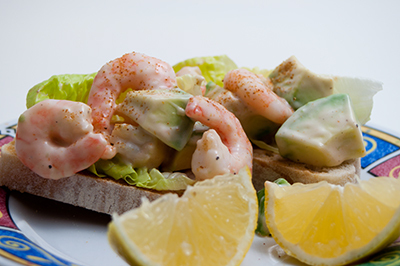 Spread a little cocktail sauce on each crostini, top with a lettuce leaf and add a spoonful of the prawn cocktail mix. Sprinkle with a little cayenne pepper and serve with lemon wedges. This was a nice starter. The ciabatta made it a bit more special than your standard prawn cocktail with bread and butter, and the hint of brandy coming through was quite festive. It was however a bit difficult to eat, as everything fell off the ciabatta when you picked it up – I would recommend providing knives and forks! The topping was too much for my ciabatta slices anyway, so I just put the extra on the side to eat, but I suppose it depends what size bread you buy anyway. Those look delicious! I love little bread appetizers. I can see where ciabatta would be a bit fragile.